With a new month comes a new featured character in the forum's Monthly Character Showcase. For April we are honoring everyone's favorite hadrosaur, Ducky! Please feel free to share your thoughts, opinions, fanart, or fanfictions concerning Ducky in this topic. We look forward to your contributions! Who knows you watch LBT? Do you watch it alone? i usually watch the sequels in my room, but i'll watch the original one in the living room. my mom knows i watch it (since she's the one who gets them for me). my 15 yr old brother knows, he doesn't watch them, we had conversation about it today while watching Jurassic Park 3, so i guess he likes it alittle, but obviously not as much as much me! I remember this one time in middle school someone sitting next to me asked if i watched LBT, I nodded, she said she watched it, then we went back to work. Oh well, right now i'll just watch them by myself, i still enjoy them. I just watch it alone. I live alone so that would explain that. I prefer watching certain movies alone, and certain movies I can enjoy either way. I decided one week ago to watch all the 13 Land Before Time movies and the cartoon series... and I watched them alone. I'm 16 years old and normally I watch horror and splatter movies, but "Land Before Time" is an exception because I grew up with these movies and I simply wanted to watch them again... and I really like all of the sequels. My friends don't know anything about it, but I don't think that they would bother me only because I watch cartoon films. My brother and my father also don't know anything, only my mother knows that I'm watching them. It's good to be the king! Caught your post on a whim otherwise I would've missed it. Welcome to the GOF! You're going to be represented by a committee in the welcome room now so don't run away! uhm... who knows that i'm watching LBT? nobody, and maybe i should keep that. I'm not sure how I missed this thread but in any case here it goes. Most of my family members know I watch LBT so that doesn't really bother me although my brother gives me a hard time when I even mention the franchise, but I just tell to be quiet and let it be. Now on to the rather touchy subject of my friends. Having a substantial group of friends when one of them learned I watched the movies the others eventually picked up on it, and for about a month and a half they would bring it up when they could, and for a while I hated it but then one day I came to a rather unique realization...the LBT was an embodiment of my childhood and I wasn't going to let that go. So I asked my friends the last time we were all together if they had any cartoons or movies from their childhood that they just couldn't go without and they mentioned several that are classics...however one of my buddies however said he didn't have a favorite movie or cartoon and that prompted the rest of us to laugh as we joked about him not having a childhood and the rest of the night we just traded barbs back and forth about movies, cartoons and what we believed to be the best of the best in both categories. So I suppose on the fact that they know isn't a problem for me, I simply ignore the jeers they make and usually have a comeback to counter, so it's for me it's okay. I don't know why. I love it. I must admit though that the last song on LBT 12 was pretty odd. I didn't like it so much. I thought that the song had no real purpose. If you notice, there is always three songs in the sequals. I think they wanted to uphold that pattern so they put an unessessary song in there to fill the gap. Other than that LBT 12 was excellent! What do you think? What's wrong with Flip Flap and Fly??? Definitely one of the best songs of LBT, and about purpose - I think this song was soo bright, colorful, it was entertaining and it's morale is being yourself wherever you are, no matter in what situation you are and also it shows Mo once again! But 3-d song of LBT 13 was really odd, "trust your tummy" who made this up?? ?If the dinosaurs of LBT can't use word Heart then the song writers shouldn't have used the other silly term! There are a couple of LBT songs which turn my stomach. The three bad one's are Flip Flap & Fly, Oops Eeps, and a part of How do you Know. How do you Know was a really nice song, but Petrie goes and slaughters it with that tummy part. If you look at the gang as he says it, they look like they're thinking "Gee Petrie....OMG that was lame". 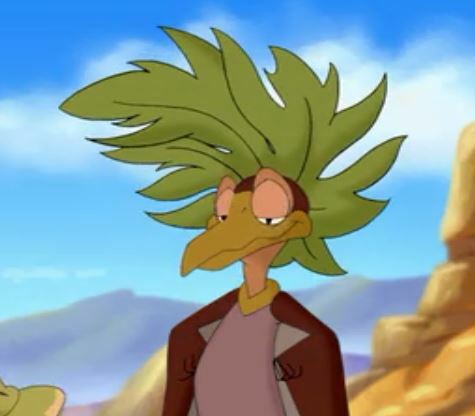 Oh, but I guess that duet between Petrie and Guido in the TV episode The Hermit of Blackrock was pretty bad too. I dunno. I've only watched that episode once. Anyway, I watch movies alone in general. Whether it's LBT or a different movie. Only my familie knows that I watching LBT. I watch LBT always alone. My family would be okay with me watching LBT, though they already know that I mostly like watching cartoons, so, what the heck. They don't like to watch cartoons anyway. First I watched The Land Before Time when I was about 4 or 5 and it was sooo awesome! !The next time was about 8 years old.Then when I was about 10 I wanted to watch it when it was shown on TV but my mother said" You watched it 3 times already, and it is for little kids" something like that. When I was 12 I got a chance to remember long forgotten(I don't remember why) LBT, but the seconds movie, I waited until mother gone, and took a VHS from my little friend, he is 4 years younger than me, and watched it.Can't say I was impressed, I was expecting something better, but it was good anyway. The next day I re-watched it and gave the VHS back to friend.I thought LBT isn't as good as it was the first one. And I forgot to say, that when I was about 11 or 12 I sworn that I will never forget Dinosaurs and Dragons, who always were my favorite. and I didn't and really happy about it because this oath made me happier , than I would be without it. I always find a sanctuary in watching Sequels, because, they are so light hearted, so peaceful, they make forget about evil around. My mother now even shames me for watching cartoons like The Mask and Men in Black, what do you think she would say about LBT? I only told my cousin about watching it, after several days of begging me to tell what I'm hiding. At first he didn't look so surprised, but more I was showing him of LBT, more he... so to say was turning away from me I wanted him to watch LBT 12 cause I find it the most family-like of all movies, but he refused. The only thing he liked was Song "Me no want new home" in TV series which is my favorite song in the series by the way. I know your feeling on the translated versions Petrie-manynumbers. They don't show tv episodes in our country either and the translations are really quite terrible usually. I did not fancy LBT XIII. I have three other members here who can testify for that. I watch LBT alone, from time to time when I feel for it. The only company I've had watching them are with other members of this baord. Those moments are something I value highly! Though nobody in my family has "caught" me watching it, I'm pretty sure they know I do. I rarely talk about it, but it's not like I'm keeping it a secret either. Do well. Live well. And dress very well. Even worse now, that my LBT VI poster is up on my wall. 1 My mother and all people who come in room will say, "you are such a kid!" Well, since I just got an email urging me to post before my account here gets deleted, might as well reply to this one. I make it no secret I watch cartoons. Most people know this. LBT is just one of many animated movies and series I like, own, watch and talk about. On a side note, I'm currently in the Philippines for an internship (I'm from the Netherlands) and the DVD's you buy here here are all illegal. You will really have to look hard to find a legal DVD. If you buy one, you get about 5 - 10 movies. I saw LBT, and I hadn't seen it in a while, so I bought it. Thing is, you can't see on the front which movies are on there. In this case a total of 4 LBT movies (+ various others). Could have done worse . Wow, you joined as early as 2004! In all the years a lot has happened in the GOF by now we have quite a few other fans from the Netherlands in our community. When do you usually watch the LBT? How much LBT do you watch? Which would you rather watch?